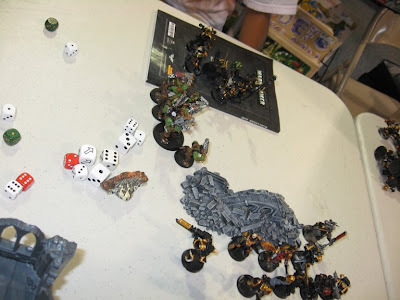 Home » games , hobbies , miniature wargaming , warhammer 40000 » Warhammer 40,000 battle report: "Komedy of Errors" as Orks slaughter Chaos Space Marines! 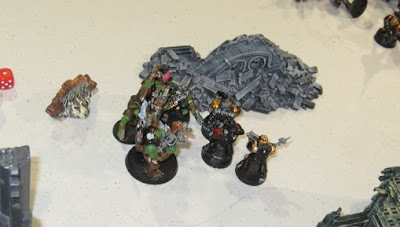 Warhammer 40,000 battle report: "Komedy of Errors" as Orks slaughter Chaos Space Marines! 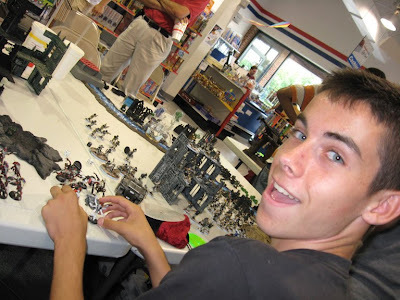 Finally got to return to the friendly local game store after business the past two weeks kept me from indulging in one of my latest newfound pastimes: Warhammer 40,000. 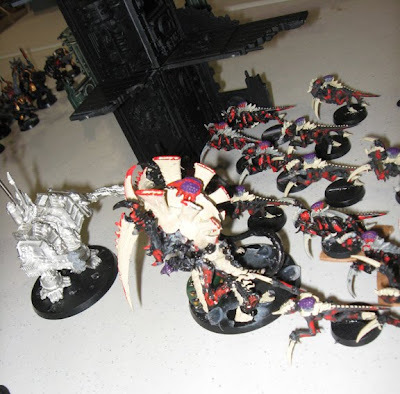 But in the interim I've been building up a new army. Ever since this past winter I've been playing Space Marines of the Ultramarines chapter (the ones that come in the Warhammer 40,000: Assault on Black Reach intro set). Lately though I've thought about changing things up a bit, and Space Marines of various stripes do tend to be the most popular faction anyway, what with every player seeming to possess at least one army of the Emperor of Mankind's most faithful servants. So for the past few weeks I've been getting my first army of Orks ready for battle. And the timing was perfect, 'cuz as a personal rule I never field any model until I'm satisfied that it looks good. If my soldiers are going to fight and possibly die for me, then they merit enough respect for me to paint them like they deserve, right? 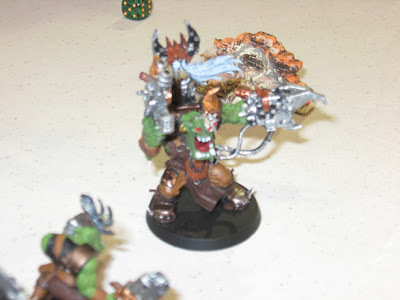 And here's my Ork Warboss. I think he's unique/powerful/ugly enough to need a proper name: anyone have any suggestions? 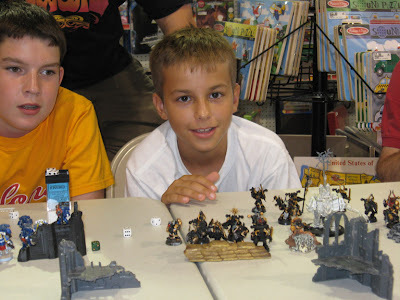 And playing a whole bunch of Chaos Space Marines were Brandon and Joe. Joe is also Tom's kid brother, and it was evident from the start that he was out to "show up" Tom. This was also Brandon and Joe's very first time playing Warhammer 40,000, so naturally a lot of the adults were on hand to show them what to do/all the tricks etc. Admittedly, the first few rounds did not go well for our side. 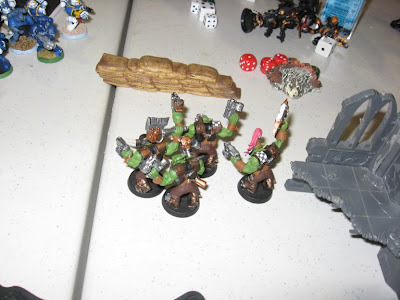 Both squads of my Ork Boyz took light casualties at long distance from Chaos Space Marine fire and neither of the Big Shootas that I was armed with hit anything. I decided to push the Orks forward and engage at close range (which turned out to have been a very wise thing in the long run). ...and then the Termagants completely overwhelmed the Chaos Dreadnought! 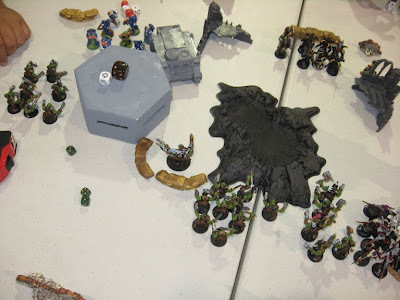 The Chaos Space Marine Dreadnought was hopelessly engaged for the rest of the game fighting off the Termagants. 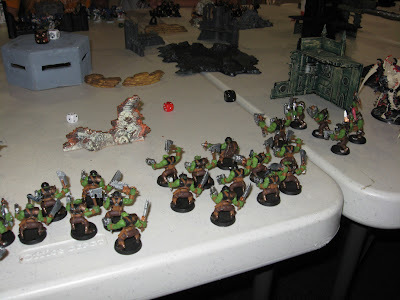 And as you can see from the pic above, that freed my Nobz to press forward without having that to worry about. 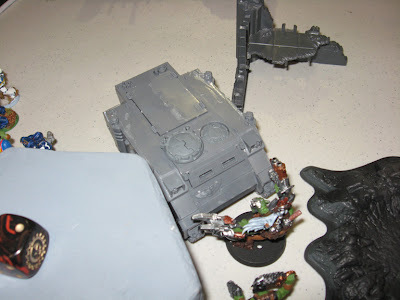 The results of that bit o' mayhem were one destroyed Rhino which blew up and no damage taken by the Warboss! It was the start of a great green tide that would soon wash over the landscape. I still can't believe I was rolling so many 5s and 6s during this murderous rampage. 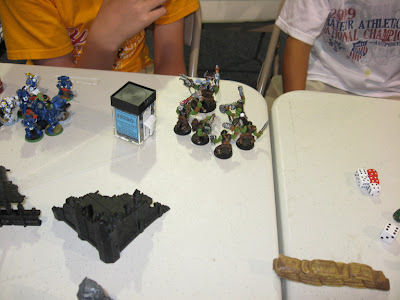 The cunning and beguiling forces of Chaos had fallen to the dumb and ugly Orks! Which, I guess in the higher scheme of the universe, means that this was ultimately a victory for Good. 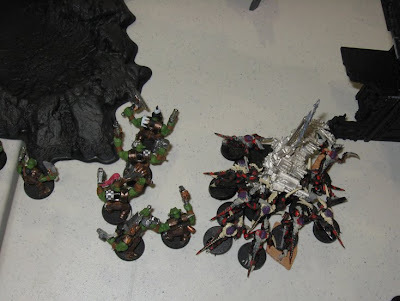 Orks aren't really evil: they're just that way by nature. Hey, J.R.R. Tolkien even said that his Orcs would not be eternally beyond redemption, so I like to think that the Orks in the Warhammer 40,000 universe have some positive inherent value too. Or maybe I've just been spending too much time painting and detailing Orks lately :-P They're definitely my favorite army to play in this game for the time being, mainly 'cuz they're such a rich source of comedic value (even though their shooting abilities leave much to be desired). NICE models! Some of the better ones that I've seen painted up :) Congratulations on your win too! Thanks :-) After I finish with the Gretchin, the Mek Boy with Shokk Attack Gun, the Bikerz and the Killa Kan, I'm gonna splurge and get an Ork Trukk. Can't wait to get to work on that one!